As I have been learning to homeschool (which I love), I came across this site called Simply Charlotte Mason. You can download audio from seminars and buy books and dvds. 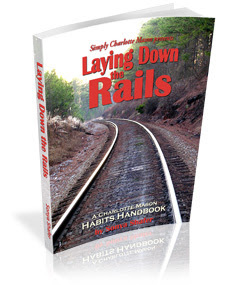 That's where I first came across the seminar for Laying Down the Rails. By the end of the audio, I had bought the book. It's no small expense at 30 dollars (with shipping), but the wisdom in it has surpassed any I have read in parenting or teaching. This isn't just a good book for homeschool. It's a great book for raising children in general. The brain has neurons that talk to one another. The more they talk to one another they start to wear a path. It becomes like a railroad track. You want your child to repeat the right track as many times as possible. You can lay down rails of cleanliness and character. Then the child goes to the desired mental destination even on into adulthood. Try it out. You will be blessed with smooth and easy days.